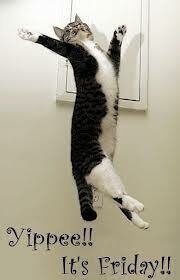 It’s Friday, so this’ll be short and sweet so we can all get on to celebrating that it’s Friday! Yay! 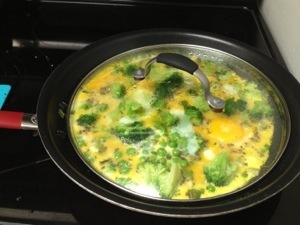 Breakfast was the usual kitchen sink frittata. + broth. And a couple of unpictured coffee. I didn’t pack a lunch, so I held myself over with the last of the coconut flakes. Then went to Safeway hungry. 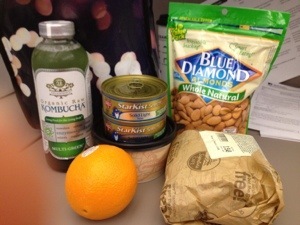 ‘Booch, tuna, soup, big ol’ bag of almonds, orange, and a chicken, bacon & pesto sandwich. Yes, I had a sandwich. It was foccacia bread, toasted, and hard to say no. 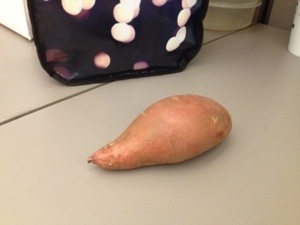 + a sweet potato, which I did not eat. I brought it home for a future meal. Don’t worry; many of these selections were intended for the desk drawer, to ward off future oh-crap-I’m-hungry-with-no-food situations, or days where my lunch is a little lackluster. Dinner was a quick ground beef hash with onion and some leftover asparagus I had marinading in the fridge that really needed to be used up. I think I might send Hulk on a Costco run over the weekend. No picture; ground beef hash is pretty unappealing in picture format. Plus, I had a very cranky-pants toddler dragging on my legs and demanding to “help” cook. After dinner, I went to a programming Meet Up I decided I want to learn how to program; I did Java in college, and played with a little SQL a while back, but nothing too formal. It would be a fun hobby, and I feel silly living so close to Silicon Valley and NOT knowing a language of some sort. And now I’m off to do Friday things. My desk is being moved to a new cube, so I have to pack my stuff and figure out what I’m going to do while IT dismantles and (hopefully) reassembles my computer. Have a most wonderful day! I prefer the Original, but can only find it at Whole Foods. I guess Safeway customers don’t normally like the plain version. But green is good, too! Hmmm, I buy Original at Safeway all the time. My top 3 are Original, Multigreen & Cranberry. I buy them so often Safeway sends me personalized “Just for U” deals 🙂 YAY. The Safeway I go to is always out of the Original. Maybe I am mistaken and it is the most popular flavor? I would LOVE to get Kombucha on Just4U! My favorite is when I have coupons for baby formula and beer. At least I have my priorities identified. Awesome! What kind of office work do you do? Never go to the grocery store hungry, come on! However, I can’t say much because I did that two days ago and bought a donut…maybe two, cheesecake and a Kombucha. Whoops! I’m an engineer by day. Yay it’s Friday! And lol, I always go shopping hungry and then wonder how I spent so much money. Normally I snack beforehand, but this was sort of out-of-the-ordinary.